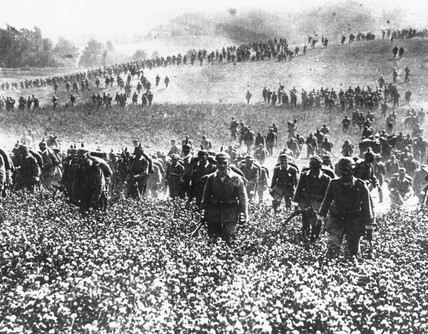 German infantry moving to take a higher position during the invasion of Belgium in August 1914. The photograph was republished in May 1940 as the Nazis invaded Belgium, France and Holland. The 'Bliztkrieg' (lightning war) operation used in 1940 caused the surrender of Belgium, Holland and France by 30 June 1940. The French built the Maginot line, a series of defensive fortreses along the German border, following the Great War to prevent a German attack. However, the German army concentrated the majority of its forces in the Ardennes and pushed into France and Belgium with similar ease to the First World War.